My favorite stories, written by me or someone else, are those dealing with characters best described as “fence post” characters which usually possess at least two or more of these traits: they are out of their element; in at least potentially in trouble: they have little or no idea how they got where they are; and have to rely on their skills and wits, to get out of the situation, though they appear to be ill-suited to do so. Think of a turtle on top of a fence post, if that helps. Sometimes a character like that can make, or save, the story you are telling, particularly if it just isn’t working otherwise. 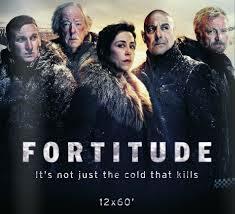 I thought of this while binge watching a new dramatic series named Fortitude. It’s on the Pivot Network, which you’ll find in the equivalent of the nosebleed seats of your cable television system. Fortitude is set in a desolate section of Solvard, a Norwegian territory; the title is the name of the small town where almost of the story takes place. Two murders bookend the first episode, and at first it looks like your typical whodunit which will be investigated by a barely competent sheriff who may well be in the tank for some special interests relating to tourism as well. Everything changes, however, in Episode Two, with the arrival of our “fencepost” character in the form of Detective Chief Inspector Morton. Brilliantly played by the criminally underappreciated Stanley Tucci, Morton is 1) an American; 2) an ex-FBI agent now working for the London Metropolitan Police; and is 3) investigating the circumstances surrounding the death of one of the murder victims, who is a British citizen in 4) a God-forsaken area of Norway that looks like Boston (or Columbus, Ohio) did last week. Morton’s arrival puts almost everyone concerned in high dudgeon, particularly the sheriff (at least at first), but there isn’t much anyone can do about it because of some treaty of some sort which gives Morton jurisdiction. Morton no sooner sets foot on the slippery ice when he starts uncovering things, frozen ground and non-stop snowfall notwithstanding. Think of a cross between True Detective and Twin Peaks (the television series, not the restaurant chain) and you’ll have a vague idea of where things seem to be going. Morton, however, out of his element but not out of his league, is the fulcrum which takes the story off in an entirely new direction. You can do this in your own work. If your story or novel isn’t working, change up your primary character. Make them uncomfortable in their own skin. Change gender or race or education level, just for a start. Even a small difference taken to its conclusion, logical or otherwise, can change the character and or the story dramatically. Downsizing your character’s abilities, such as they are, and throwing them to the sharks when they can’t swim works even better. I read a book several years ago — and I apologize out front for not being able to recall either the name or the author (yes; I’m getting old) — of an Asian father whose daughter disappears while attending college in England. He doesn’t speak English but makes the trip, determined to find her, armed with little more than fortitude and a keen power of logic and observation. I do recall the name of a short story — because I have read it at least once a year since it was published — which puts a somewhat unassuming turtle on top of a very dangerous fence post. 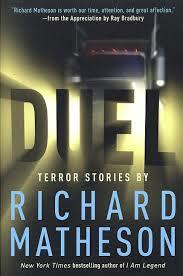 I’m speaking of “Duel” by Richard Matheson. “Duel,” in case you haven’t had the pleasure, concerns a motorist named “Mann” who is terrorized along several miles of highway by a trucker. The story was written over four decades ago, some eighteen years before the term “road rage” ever entered the nation’s lexicon, but still reads well. Mann is not Jack Reacher, or even his baby brother; he is totally out of his element and just wants to be left alone to keep driving. It doesn’t happen, of course, but what does will keep you reading. Steven Spielberg made an excellent attempt at capturing Matheson’s magic in a made-for-television movie, but you have to read the story to really appreciate what Matheson did so well. Now, if I might ask…authors: have you tried this? And readers: have there been any fish out of water characters that you have enjoyed in novels, stories, or films? Please. Share with us.